Part Number: SR10J. - Socket 1155, LGA1155. SKU: SR00T. Notes on sSpec SR00T. Socket type Socket 1155 (LGA1155). Type CPU / Microprocessor. 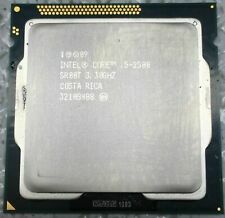 Processor number i5-2500. Processor core Sandy Bridge. Tested for Full Functions, R2/Ready for Reuse. Core stepping D2. All S-Specs »Core i5 » SR00T. SR00T specifications. Notes on sSpec SR00T. Socket type Socket 1155 (LGA1155). Core stepping D2. Processor core Sandy Bridge. Enhanced SpeedStep technology?. These will be 100% functional, but they may. LGA1155 Socket. Compatible Processor Socket. This is a used Processor in great condition. Processor Number. Product Type. Installed Size. Type / Form Factor. This CPU is used and is in good working order. It was removed from a fully working system. ElectronicsCaféspecializes in used electronics. By purchasing this product you confirm that it will be used for it’s originally intended purpose. QDCW SR10H. Core stepping P0 (SR10H). Socket Socket 1155 / H2 / LGA1155. This CPU is in working condition. Type CPU / Microprocessor. CPU part numbers. BX80637G2020 is a boxed processor with fan and heatsink (English version). Trending at $24.53eBay determines this price through a machine learned model of the product's sale prices within the last 90 days. Step Code Q12W (down clocked ES version of i7-2600 3.1Ghz vs 3.4 Ghz). FOXCONN LGA115X, LGA 115X. LGA1150, LGA1151, LGA1155, LGA1156 CPU Socket Protector Cover. 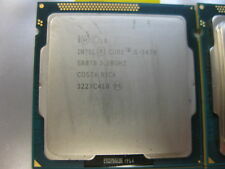 Processor Number i5-3470. Processor Base Frequency 3.20 GHz. Processor Graphics. CASE 67.4°C. Instruction Set 64-bit. Low Halogen Options Available Yes. Thermal Solution Specification 2011D. Sockets Supported FCLGA1155. 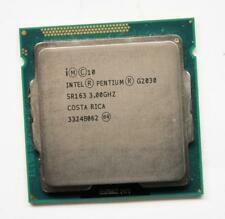 Intel Core i5-3350P SR0WS 3.1GHz 1MB/6MB Cache Socket 1155 CPU Processor. Intel Core i5-3350P SR0WS 3.1GHz 1MB/6MB Cache Socket 1155 CPU Processor. . Condition is Used. Shipped with UPS Ground. Intel Core i7-3770K 3.5GHz Quad-Core CPU - Socket LGA 1155. Mainly used for light intermittent gaming and some video rendering. Condition is Used. Shipped with USPS Priority Mail. Notes on sSpec SR0UF. Processor number G2120. Socket type Socket 1155 (LGA1155). Processor core Ivy Bridge. The part is discontinued. Core stepping P0. Virtualization technology (VT-x). Execute disable bit. All S-Specs »Core i5 » SR008. SR008 specifications. Notes on sSpec SR008. Socket type Socket 1155 (LGA1155). Processor core Sandy Bridge. Core stepping D2. Your cooperation is necessary and appreciated. Trending at $40.50eBay determines this price through a machine learned model of the product's sale prices within the last 90 days. Be sure to check your original part number and socket type to ensure compatibility. Intel Pentium G840 Socket LGA 1155 2.8GHz SR05P CPU Processor . Condition is Used. Shipped with USPS First Class Package. Intel Core i3-3240 SR0RH 3.40GHz desktop PC processor Socket LGA 1155. Be sure to check your original part number and socket type to ensure compatibility. Serial # : NA.